College is definitely a place for learning and self-discovery — just not always on campus. Off-campus adventures are all part of the fun of going away to school, and college nightlife plays a huge part in shaping that experience. There are lessons to be learned outside of class and away from the library, when you close your books for the night, leave the tiny confines of your dorm, and go see what the real world can teach you instead. Because as great as life on campus can be, it’s not until you start exploring the city around you that the real fun starts. The off-campus culture of a college can draw in students just as much, or more, than the campus does itself. Though campus life can offer a sense of community through athletics, crazy traditions, and dorm life, off-campus is where students really let loose and have fun. Whether it’s great late-night food, a thriving nightlife scene, or venues that encourage artistic or cultural expression, some college campuses are truly #blessed with a great off-campus experience. From big city schools to small college towns, these nightlife hotspots have a little something for everybody. Need a break from the books? We suggest checking out these 11 off-campus party scenes. 1. M Street — Washington, D.C. Whether it's because they're trying to be the next president of the United States or the next Olivia Pope, young political hopefuls flock to D.C. to attend school, and for good reason. Not only does a college education in D.C. open a plethora of doors to government jobs, it's also a bustling city rich in culture and history just waiting to be explored. M Street provides a great atmosphere for Georgetown and George Washington students to enjoy both day and night. The Shops at Georgetown Park are a great place to shop in an open-air setting, and a short walk down M Street brings with it a number of unique dining opportunities. If you're looking to soak up some of our country's history, or just want some extra credit in your history course, take a trip to the National Geographic Museum. The city becomes more alive at night, with plenty of bars and live entertainment to keep you busy. 2. Marshall Street — Syracuse, N.Y.
Syracuse's weather may not be very inviting to students who want to get out of their dorms and check out the nearby area (at least in the wintertime), but Marshall Street is just off-campus for when the weather warms up and you want to celebrate with a drink. Marshall Street offers a variety of great restaurants and plenty of shopping. The Unique Tea House is a cool place for students to relax, study, and sip some bubble tea, while bars like Chuck's Cafe and DJ's on the Hill are perfect for a night out or to have a beer and catch a game when 'Cuse is on the road. 3. Franklin Street — Chapel Hill, N.C.
University of North Carolina-Chapel Hill students are big fans of the nightlife Franklin Street has to offer. There are tons of bars with a wide range of different atmospheres and entertainment to choose from. He's Not Here is a favorite of UNC students, famous for its Blue Cup specials that offer 33 ounces of beer for only $4 to $6 — a dream come true for college students on a budget. Top of the Hill is known for being one of the nation's best breweries, and even has its own distillery. If live music and hard liquor are more your style, head to The Library (no, not the school library) for $1 well drinks and music that will make you dance the night away. 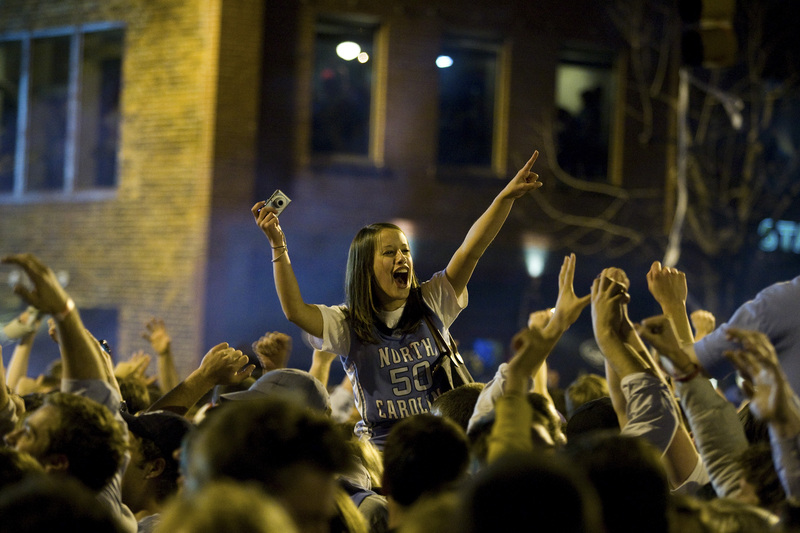 But beware — if you're headed to Franklin Street after a big Tar Heel victory, you may get caught in one of their infamous street storms, which is basically just thousands of rowdy fans flooding the streets to celebrate. 4. MacDougal Street — New York City, N.Y. In the heart of Greenwich Village, MacDougal Street is a hotspot for New York University students and locals alike. The bars and live entertainment are a great representation of the Village's trendy culture. Grab a sweet treat from Creperie NYC or some to-die-for falafel at Mamoun's Falafel. Once you're full, head to Blue Note for a live jazz concert, or have a laugh at the Comedy Cellar. New York City is New York City, so there's something to do wherever you are, but for a true cultural experience in a cool neighborhood, spend a night on MacDougal Street. Though not native to one school, Newbury Street in Boston is a hot-spot for all of the city's college students. The street spans eight blocks and is lined with some of the best, most unique, shopping and dining experiences in Boston. During the day, get lost in the original Newbury Comics store, or check out quirky Johnny Cupcakes (note: they don't sell cupcakes). At night, explore the cuisine at Itadaki Japanese restaurant, or channel your inner creative at The Paint Bar, where you can show off your artistic skills painting while enjoying a few adult beverages. All of downtown Athens is beloved by the students of University of Georgia, but Clayton Street seems to be where the action really happens. The area boasts tons of bars that provide live music and a wide array of food options for a Friday or Saturday night on the town. Many students make a weekly trip downtown, which is easy as it is walking distance from UGA's campus. Check out Last Resort Grill for a great meal and cocktail, or grab a slice of pizza and a beer at the Mellow Mushroom. Right on the waterfront of Burlington and down the hill from University of Vermont and Champlain College is Church Street, a quaint, brick road with the city's best restaurants and nightlife. Boutiques and second-hand stores line the street, making it an affordable shopping destination for college students. Live music is abundant on weekend nights, and can even be heard from the street so you can venue-shop as you stroll. For a great people-watching experience while you eat and drink, this is definitely the place to go. Oh, and did I mention Church Street is the home of the original Ben & Jerry's? So, yeah, there's that too. Ann Arbor's Main Street is home to many bars, all with daily happy hours, so it's no wonder this street made it on our list. These bars crack down on underage drinking, so it's truly the 21 and older crowd who, hopefully, know how to handle their alcohol and have a good time who get to enjoy the rich nightlife scene here. On Ninth Street, students at the University of Missouri can find all the essentials: sandwich shops and Chipotle for a quick bite to eat, Starbucks for a caffeinated beverage to fuel those all-nighters, plenty of pubs and bars to reward oneself after a long week (or hour) of studying, and late-night eateries (like crowd-pleaser El Rancho). The strip is home to many small businesses, family-owned restaurants and ice cream shops, which adds to the city's charm. Austin is the live music capital of the United States, and the students of the University of Texas get to soak in the entertainment first hand. On 6th Street, you'll find the epicenter of Austin's live music scene. The street is divided into sections that are each home to their own speciality. The Drag, which is closest to the UT campus, offers eclectic shops and quirky goodies; Red River is the live music and entertainment hub; SoCo is the city's equivalent of New York's SoHo; and the Warehouse District appeals to the more sophisticated types. With such a diverse range of food and music options, every student is sure to find a go-to spot that appeals to their tastes. Boulder, Colorado is a cool college town all around. Students get to enjoy the views and weekend trips to the mountains. To make life even better for UCB students, the Pearl Street Mall, a four-blocklong outdoor shopping and dining plaza packed with creative cuisine, hip boutiques, and live entertainment, is only a short walk away. Cool events are offered year-round, but since Boulder can get extremely cold in the winter, the best ones usually happen in the summer. With entertainment such as Bands on the Bricks and the Open Arts Fest, students are guaranteed to always have something to do. Bonus: Many of the mall's restaurants serve lunches under $5, which is essential to living when you're dealing with a college student's budget.